We ended the last essay with some thoughts on the words of the Apostle James, words that deal with ideas on the choice between “God and mammon” (Matthew 6:24) which the Master presents to us. James shows us the reality of men’s choice of focus upon the self and the things of the self in this world and he does so from the perspective that this IS the most natural choice for men who ARE born into this world of vanity….a world from which they must escape. James holds out the reality of one’s focus upon the things of God as the opposite of this focus upon the things of the flesh as he tells us that the Lord “giveth more grace. Wherefore he saith, God resisteth the proud, but giveth grace unto the humble” (James 4:6). We should try to see here that this idea of grace IS the reward to the man who IS humble and the Greek word that IS rendered as humble here, tapeinos, should NOT be seen in the simplicity of the English idea as doctrines teach. It IS tapeinos that IS used by Matthew in Jesus description of Himself saying “Take my yoke upon you, and learn of me; for I am meek and lowly in heart: and ye shall find rest unto your souls” (Matthew 11:29); here the idea IS rendered as lowly but we should understand that this IS the intended characteristic of ALL men who can escape the vanity to which ALL ARE subjected. The point of this word IS simply a lack of that self-serving attitude which IS part and parcel of the vanity much as the opposite idea of being proud IS one’s expression of this attitude in Life. This IS the choice between “God and mammon” shown to us in terms of the True results of that choice. Choose the world, choose to be “a friend of the world“, and one IS choosing to be “the enemy of God” (James 4:4) whom “God resisteth“. Can we see the point here? And can we see that the man whose focus IS upon the things of God IS rewarded with the True grace which IS given “unto the humble“. Again we must remember that the words used here by the translators ARE NOT accurate indicators of the apostle’s intent and this especially when we consider today’s common understanding of the English words. Beginning with the ideas of “bitter envying and strife in your hearts” through the expression of Love, of agape, that IS “the wisdom that is from above“, we have lost the force with which he IS writing, a force that IS NOT lost however in his continuing words where he accuses men of being carnally focused….even calling them “adulterers and adulteresses” and telling them that by their focus upon the self and the things of the world that they ARE “the enemy of God” (James 4:4). What we should try to see here IS the same blunt and harsh tones and ideas in his previous words as we see in these. While “bitter envying and strife” may be common in the attitudes of men, they ARE ill defined; in the ideas of the emulation and a factious and divisive attitude that we apply to the Greek words however we have a more hidden human condition and one that has led to much division especially in the church where many thousands of denominations and sects ALL vie for supremacy. “From whence come wars and fightings among you? come they not hence, even of your lusts that war in your members? Ye lust, and have not: ye kill, and desire to have, and cannot obtain: ye fight and war, yet ye have not, because ye ask not. Ye ask, and receive not, because ye ask amiss, that ye may consume it upon your lusts. Ye adulterers and adulteresses, know ye not that the friendship of the world is enmity with God? whosoever therefore will be a friend of the world is the enemy of God” (James 4:1-4). In this we should try to see the far reaching reality of the Greek word hedone which IS rendered as lust. Two different Greek words ARE rendered here in James words as lust; this first one points to pleasure and in this we should see ALL ideas that bring one pleasure including one’s own thoughts, emotions, attitudes and proclivities….it IS for ALL of this that men fight. It IS these and more which ARE “your lusts that war in your members“; it IS this same sense of pleasure that we should find in the prayers of men. James tells us that “Ye ask, and receive not, because ye ask amiss” and here we should try to understand the impact of this idea: that prayer for the things of the self in this world ARE NOT the intended object of prayer and that in so praying, “ye ask amiss“. The key here then is again hedone and the idea IS that one’s motivation in asking for the things of the self IS simply to satisfy some carnal pleasure and in this idea we should see ALL things that can provide: enjoyment or satisfaction derived from what is to one’s liking; gratification; delight* as the dictionary defines pleasure. Can we see here the far reaching implications of this Greek word that IS defined by Strong’s as: sensual delight 9a. In our terms these ideas ARE reflective of the focus of one’s Life and here again we should understand that one’s focus upon his doctrinal ideas of God IS NOT an indicator of such one’s True focus. At most every level of doctrinal adherence and at most every level of one’s position in the church we will find that most ALL involved ARE yet focused upon the ideas of self, of family, of nation and of their own religious leaning and in these there IS much that can be seen in terms of emulation and factious divisions. To this must be added the plain refusal by most ALL to see the most basic Truths in Jesus’ words in favor of holding onto their way of Life as men in this world. This refusal IS based solely in the doctrines of men that seek to allow a man to keep his objects of pleasure, be they things, thoughts, attitudes or emotions, and to live his Life based in a doctrinal promise of salvation that IS at best pieced together from separate, unrelated and out of context ideas from the writings of the apostles. In these writings the works of Paul ARE most often used as they ARE seemingly more amenable to the way of Life that men have ever sought for themselves. In this context the words of James ARE seldom used and this IS likely because of his blunt and seemingly harsh delivery which can easily convict even the most ardent doctrinal Christian. As we have discussed, James writes with an ‘if the shoe fits’ attitude to a general population of Christians on ALL levels while Paul addresses his words to those whom he believes have risen to his own level of ‘faith‘. We should add to this the way that some of James’ words seem to be in direct conflict with those of Paul although when taken in the proper perspective there IS great harmony in their ideas of Truth. Our focus however should ever be upon the words of the Master whose words and example ARE “the way, the truth, and the life” (John 14:6) and here in these words we should see a classic example of the emulation and factious divisions created and maintained by the Christian church from the beginning as they have taken the person of Christ to be this idea rather than what it IS that He Himself has told us that He stands for. While the modern dictionaries definitions of emulation ARE restricted to the tendency of men to: try to equal or excel; imitate with effort to equal or surpass: to rival with some degree of success*, this IS largely the effect of the idea behind this word being diluted and changed. The 1828 Webster’s Dictionary offers us a much broader idea of emulation that should be attached to the Greek word zelos rather than the diluted idea of emulation or the later doctrinal choice of jealousy. Webster’s 1828 dictionary shows us emulation as: The act of attempting to equal or excel in qualities or actions; rivalry; desire of superiority, attended with effort to attain to it; generally in a good sense, or an attempt to equal or excel others in that which is praise-worthy, without the desire of depressing others. In a bad sense, a striving to equal or do more than others to obtain carnal favors or honors 1. Of note here ARE the ideas of desire of superiority, attended with effort to attain to it which better shows us James’ point and the idea that such can be accompanied by the desire to obtain carnal favors or honors. Taking these ideas into Vincent’s commentary on zelos which IS written in the nineteenth century before the dilution of the idea of emulation; he writes of zelos that: The rendering envying, as A. V., more properly belongs to φθόνος , which is never used in a good sense. Emulation is the better general rendering, which does not necessarily include envy, but may be full of the spirit of self-devotion8. In the 1828 definition the idea of emulation IS an active competitiveness that NOT ONLY seeks to mimic another but to DO better….to be superior; from a spiritual perspective, there IS NO real good sense to this and we should try to see that from that same perspective ALL emulation IS with a desire to obtain carnal favors or honors. We should see here that this activity of human nature IS both a cause and a result of the next idea in James’ words, eritheia which IS wrongly rendered as strife here in the King James Bible and in terms of selfishness and selfish ambition by many others. Again we turn to the defining ideas from Strong’s where we can see the uncertainty of the Greek word as they tell us that eritheia IS: Perhaps as the same as ἐρεθίζω (G2042) which IS erethizo. Strong’s tells us that erethizo means: to stimulate (especially to anger) while eritheia means: properly, intrigue, i.e. (by implication) faction 9a. Thayer’s sees eritheia as: electioneering or intriguing for office 9 and in this we should be able to see a most basic function of emulation as defined by Webster’s above: a desire of superiority, attended with effort to attain to it. Sans the idea of elections and office which IS taken from ancient Greek usage of the word, we should be able to see how that to express such traits IS simply to see oneself above others, superior if you will, and to use that sense to promote oneself and one’s perspective on the world. It IS ever such that IS factious and which promotes division and if we can see the creation of the thousands of denominations and sects of Christianity in this idea, we can then see James’ point which says that whatsoever comes to a man IS NOT “the wisdom that is from above” if it incorporates any of these ideas….such IS NOT words from God. Such IS rather “earthly, sensual, devilish” and this regardless of the motivations that ARE assumed to be at play. And it IS these same that DO lead to “wars and fightings among you” as these stem from the seeking of Earthly pleasures and those things that everyman believes that he deserves. We should try to see how that this afflicts every strata of men as one’s sense of emulation seeks to at least put him above others at his own level. We should understand here that this IS a normal human response for ALL whose focus IS yet on the self and the things of the self in this world and it IS in this condition that the wisdom that one receives IS carnal or, as James frames this “earthly, sensual, devilish” which ideas ARE indicative of the worldly source of that wisdom. It IS “the wisdom that is from above” that comes to the man whose focus IS upon the things of God and it IS this focus by which a man ceases to be “a friend of the world” which James tells us IS tantamount to being “the enemy of God“. As we discussed in the last essay this Wisdom IS proton men hagnos which should be understood as “first Truly hagnos“; it IS this idea of hagnos which IS rendered as pure that needs further clarification to take this idea to the spiritual reality from whence this Wisdom comes and away from such ideas as chaste and pure as James’ words ARE commonly understood. We should understand the idea of pure in terms of the Christ of whom the Apostle John tells us that “Beloved, now are we the sons of God, and it doth not yet appear what we shall be: but we know that, when he shall appear, we shall be like him; for we shall see him as he is. And every man that hath this hope in him purifieth himself, even as he is pure” (1 John 3:2-3). This IS the reality of hagnos when viewed as a spiritual concept which, in the context of that “wisdom that is from above” IS the ONLY way that this should be viewed. This is much like the Apostle Paul’s words that we discussed a in our last post; Paul tells us that “we have received, not the spirit of the world, but the spirit which is of God; that we might know the things that are freely given to us of God” (1 Corinthians 2:12) and here we should remember that the apostle writes to those whom he believes have risen to his own level of ‘faith‘ and NOT with a more general attitude as DOES JAMES. We can see this in the way that Paul begins his epistles; in his Second Epistle to the Corinthians he begins with “Paul, an apostle of Jesus Christ by the will of God, and Timothy our brother, unto the church of God which is at Corinth, with all the saints which are in all Achaia” (2 Corinthians 1:1). Here we have the idea of saints from the Greek word hagios which IS an alternate adjective form of hagnos above. Hagios IS most always rendered as holy while hagnos IS rendered as pure and IS used far less; here we should remember Thayer’s defining ideas for hagnos which include a combination of spiritual and carnal ideas. Thayer’s says: exciting reverence, venerable, sacred; and then, pure, pure from carnality, chaste, modest; and finally pure from every fault, immaculate 9. Taking away the carnal implications we ARE left with yet another doctrinally nebulous idea….holy. In the ideas of holy, saints, sacred and immaculate we DO NOT have any reference to the man whose focus IS yet in this world; to any man whose center of Life IS himself or the things of the self. What we have in these ideas of holy, saints, sacred and immaculate IS the man whose focus IS upon the things of God….the man whose expression IS Love. Here again we must understand that the most central idea of agape IS NOT in any way carnal; agape IS NOT related in any way to the emotional and mental attractions and attachments that men have for others or for any part of his carnal Life or the world. James tells us that “whosoever therefore will be a friend of the world is the enemy of God” while Jesus tells us that “If any man come to me, and hate not his father, and mother, and wife, and children, and brethren, and sisters, yea, and his own life also, he cannot be my disciple” (Luke 14:26). It IS this idea of forsaking that prevents the Christian from heeding the Truth and it IS in this failure that the doctrines of men have been constructed. Peter tells us this same thing in such sayings as “Whereby are given unto us exceeding great and precious promises: that by these ye might be partakers of the divine nature, having escaped the corruption that is in the world through lust” (2 Peter 1:4). Here the True salvation of a man, his True ability to be “partakers of the divine nature“, IS found in his ability to escape from the clutches of worldly living which ARE based in the very same emotional and mental attractions and attachments that men have for others or for any part of his carnal Life or the world. Scripture IS filled with examples of this forsaking beginning in the words of Jesus who tells us about one’s treasure, those things of importance to him as an individual, saying “where your treasure is, there will your heart be also” as well as his words on that choice between God and mammon as He tells us that “Ye cannot serve God and mammon” (Matthew 6:21, 24). Surely these ARE difficult things to DO, especially as a man who has KNOWN NO other way than the carnal ways of the world and it IS in this sense of difficulty that so much of doctrine has diluted and changed the intent and the importance of these ideas into their own ideas of salvation based in grace and in the atonement based in the blood of Jesus. A Truer substitution IS NOT Jesus dying to relieve the sins of the world, past, current and future, and make them of NO importance so long as one believes; the True substitution IS framed by Jesus who repeats the words of the prophet saying “in vain do they worship me, teaching for doctrines the commandments of men” (Mark 7:7). We should try to understand the the whole idea of substitutionary atonement IS akin to the Jew’s use of Moses’ ancillary parts of the law as their cover for NOT living in accord with the most basic parts of the law which ARE the offered as the Way of Truth that governs men’s relationship with the Lord and with each other….Love. Jesus continually denudes the Jew’s approach to the law as He rails against their use of it as a cover; in such sayings as “if ye had known what this meaneth, I will have mercy, and not sacrifice, ye would not have condemned the guiltless” (Matthew 12:7) we have a potent example of the Master’s point as He speaks against the ancillary and in favor of the True laws of Love. IS this NOT similar to the Christian ideas of atonement which they have taken from their own creative past and embellished to become their Truth while they too leave the law of Love in that same abyss as did the Jews? The Jews’ doctrinal approach to God told them that so long as they kept the ancillary parts of the law that they were covered and so they embarked on the route of sacrifice, of keeping the sabbath and other ‘holy’ days while they lived in ignorance of the Truth. For the Christian there ARE NO sacrifices, nor IS there a sabbath and the idea of ‘holy’ days IS kept by ONLY a part of the church, albeit with some importance, and the Christian too IS left ignorant of the Master’s own Truths. In many ways the Jew’s approach was the more valid as they had both the deeper Truths and the ancillary laws combined into the same set of instructions given them by Moses. The Christians, in their own attempt at cover, have created their own rules; first by declaring that the bible IS the word of God….that it IS God that speaks through the words of the writers and second that whatsoever IS in this book IS His word, which for much of the church has become infallible. This approach in ALL its machinations IS based upon the negotiated agreement of men in the early church, men who decided what IS and what IS NOT canonical and, from any reading of the writings of the Church Fathers, we can see that there IS NO universal agreement. For us the idea of infallible DOES NOT work with the idea of negotiated; and while we DO see the writings of the New Testament as inspired, we also recognize that they ARE written through the filters of the individual personalities of the writers. We should ever try to see and to understand that the whole idea of inspired writing as we have here in scripture IS based in the revelations and the realization that come to the minds of men through the heart and from the Soul. We should see as well that such revelation and realization DO NOT come into the Life of the man whose focus IS upon the self and the things of the self; for this man any realization IS of and for the self and IS what James writes of saying “This wisdom descendeth not from above, but is earthly, sensual, devilish“. These realizations would be simply that to the secular man who IS NOT exposed to the wranglings of the doctrines of men; for those who ARE so exposed however such realizations take on the form of words from the Lord, the voice of God if you will, which can cover most any subject matter. From guidance on what kind of car to buy to what kind of spouse to seek men ARE seeking guidance from God and many ARE doctrinally instructed to ‘ask the Lord’, to wait on His reply and to follow the leading of the Holy Spirit which they believe speaks to them. But James gives us the reality of this in his words about wisdom and Wisdom and from the way that he writes these words, it can be easily seen that men believed that they were hearing was from the Lord in his day….perhaps they were thinking that they were privy to prophetic words. Regardless of what they may have thought in those days, James sees the need to discuss this dynamic of the realizations of men and to show us how that we can KNOW if we ARE hearing from God or from the carnal personality in this world. Here, if we were to put much of the Christian doctrine to the test, on what side would we find much of the teaching? On the side of wisdom or on the side of Wisdom? We will NOT go there today but perhaps each one could test his own beliefs and realizations against James words on what IS that “wisdom that is from above“. This “wisdom that is from above” IS spiritual and as such must perforce come from the Spirit. This Wisdom comes via the Soul into the consciousness, the heart of a man at any given time, and then into the mind and for such Wisdom to be “from above” it should meet the criteria which James shows us….NOT some, but ALL of the qualities which he lists saying “the wisdom that is from above is first pure, then peaceable, gentle, and easy to be intreated, full of mercy and good fruits, without partiality,h and without hypocrisy“. And we should understand here as well that the wisdom that “descendeth not from above” IS perforce from below and IS attuned to the “earthly, sensual, devilish” workings of the minds of men which ARE ever thoughts and feelings of and for the self in this world. “Owe no man any thing, but to agapao one another: for he that agapao another hath fulfilled the law. For this, Thou shalt not commit adultery, Thou shalt not kill, Thou shalt not steal, Thou shalt not bear false witness, Thou shalt not covet; and if there be any other commandment, it is briefly comprehended in this saying, namely, Thou shalt agape thy neighbour as thyself. 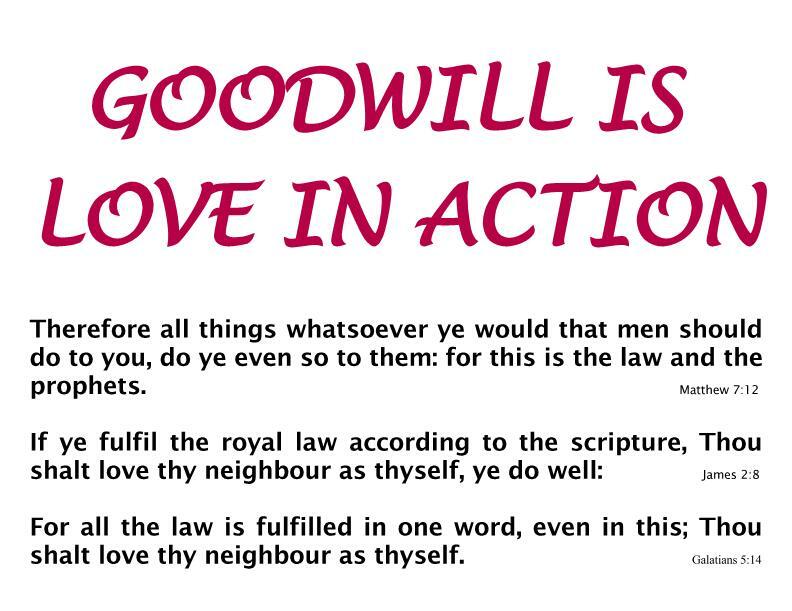 Agape worketh no ill to his neighbour: therefore agape is the fulfilling of the law. And that, knowing the time, that now it is high time to awake out of sleep: for now is our salvation nearer than when we believed” (Romans 13:8-11).